Improving the experiment to make it ‘repeatable’ and ‘catch up’ for those who had difficulty last time- The AIM: similar results!. 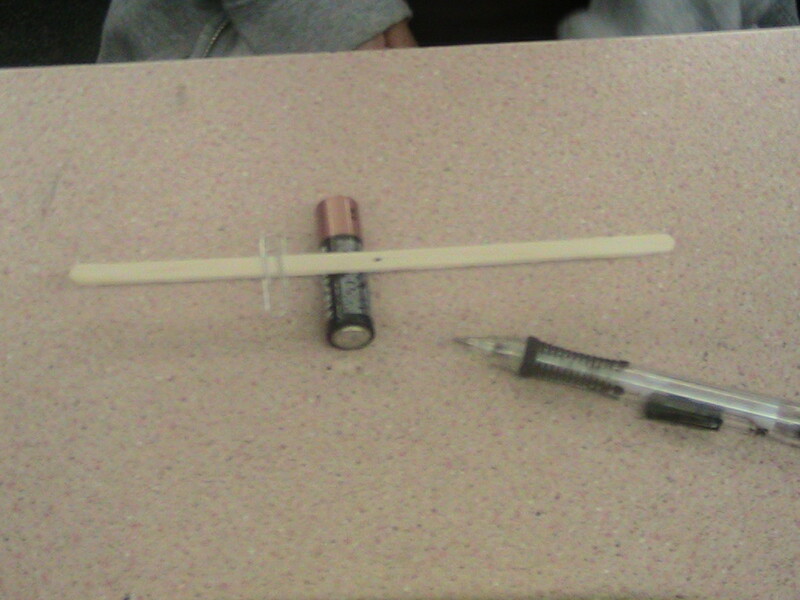 Ray’s Gr 5 Simple Machines unit. Fall 11- under construction.- Feel free to help improve this! Can you speak another language? Let me know at ray.myrtle (at) gmail.com I want to produce other language versions of the lessons so that ESL & parents with limited English can understand the material- some of this is just materials and ideas ‘parked here’. 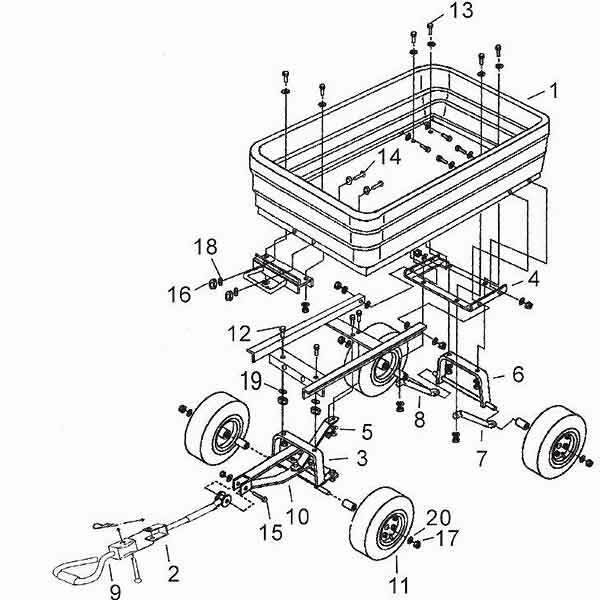 Use the wagon as a simple machines quiz. (find the simple machines)- Didn’t work too well. Need a better one. READ ALL OF THE CRITERIA (rules) BEFORE YOU START! 1. Hypothesis: means: What do you think will happen? You can also use a question: What are we trying to find?– for example: How far are paper clips from the fulcrum when the lever is balanced? 2. Materials: Exactly what things did you use? List them. 3. Method: (this part is optional) Describe EXACTLY how you did the experiment. Write out each step so someone could copy exactly what you did and get the same results as you did. 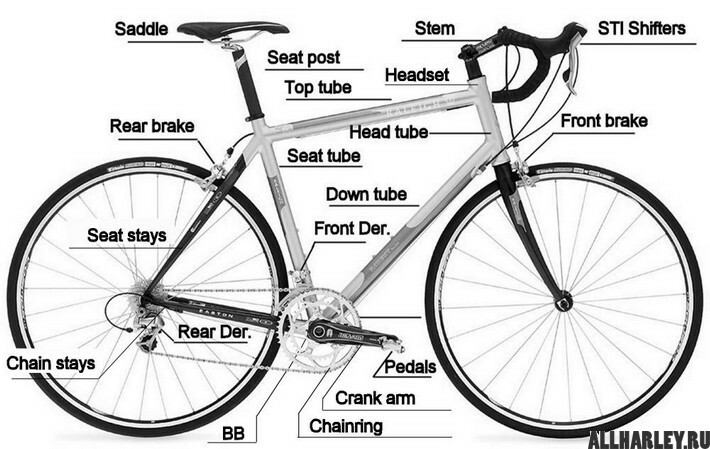 Use diagrams to help make it clear. 4. Results: This is the measurements and other observations you made during the experiment. the Data Table is the most important part. Include the results from other people in your class in your data table. Put your data into a Graph. Label the graph. 5. Conclusions: Explain what happened. Looking at the results, what patterns do you see? Errors: Why do you think we got different results sometimes? Why did Steven get 8 cm?What could explain it? Think about the way the experiment was done. Give the three best 3 reasons why some results might be different. All words level on the page- no printing up or down, except on the side of the graph. Use a ruler to draw lines. Space out the parts of the poster so that it is not crowded or emply in any part. Rubric: A chart that tells you how the poster will be evaluated and helps you know what to do. Required– what you have to do. Most title, labels are missing. Did not follow all criteria. Writing may be difficult to read. clear in most parts. Criteria followed. Here are some ideas I’m playing with about the final test.. 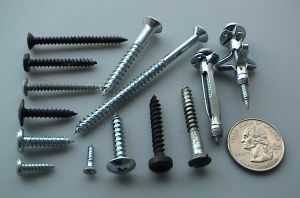 This page is designed to be a revision of the Fall 2011 Simple Machines Unit. and open to the Science page, so you can get a quick check on what is expected. Latest Simple Machines Unit Plan in backwards design format: (note day by day plan is on the last page). To download these pictures in your own flip lesson, go to the Pages and Files link on the left side-to download, you will need to be a member of the wiki- (click on ‘join now’ on the top left). To learn how to put information into a graph and label it. To learn to read a graph and make a conclusion. Download* the #2 & #3 blackline masters from here. *FYI- The reason for the insistence on following the directions in the text (which might not be appropriate at other times), is that this excerpt is written to be used during the first week of school, when learning to complete a graph was NOT as important as the underlying goals for this activity: 1) to establish following directions,(if students don’t follow your directions during the first week, they never will!) 2). to quickly gain an assessment of students’ writing ability, and ability to infer. Here is a pretest #1, Static Friction Experiment Quiz.doc you can use to help the student focus on what they need to learn about the experiment. Lesson 3- How to write a one page Science Report.– Although it is not central to the simple machines outcomes, I believe that Science Reports do encourage the development of the science skills in the IRP and help provide a foundation for success in science through K-12. Watch the description of the Flip Lesson on writing the Science Report. You can watch it below. I’m going to try to split this apart so its not as long. and some comments about the report.. Here is a quiz as an opening activity to check ability to do the graph, label the diagram and draw conclusions and notice errors. Lesson 4- Kinetic Friction Experiment – this experiment is very similar to the Static friction experiment. The purpose is to enable those who successfully completed the Static Friction Experiment to go on, while the teacher can do ‘Correct & Catch’ up with those who did not do the first experiment write up correctly. Here is a written version of the instructions Lesson 3 Kinetic Friction.docthat you can hand out to those students who cannot see the video version. The purpose of this experiment is to illustrate about a key characteristic of simple machines: they change distance in to force. We will find the difference in the amount of force needed to lift a weight straight up or lift it up on an inclined plane. How to measure with a ruler (note start at 2:45 minutes- the part before that is about the imperial system. Download instructions Lesson 6 (need to change from #5) Lesson #5-First Inclined Plane.doc. to use data to make a prediction or hypothesis and test it. I’m going to try to do a video on how to think about the ideas in this experiment. I’ve removed old #8 video. The wheel is a wonderful invention that reduces friction. Usually in that case the wheel spins on the axle. However when the wheel is FIXED to the axle it is can change distance into force. Here is a rough copy for collection of data. Download a description of the experiment using starbucks cups. See also Bill Nye YouTube or NFB animation on the Pulley. that if you double the weight on one side, you need to double the distance on the other. This leads to L x W= L x W (Length x Weight on one side)= Length x Weight on the other side). Near the Force= 3rd class (baseball bat or fishing rod). Related to this is the understanding that the 3rd class lever is use force to create more distance (or speed) (the opposite of most of the other simple machines)- the 1st class lever can do this as well by changing the length of the levers and placing the force on the shorter end and the load on the longer end of the lever. 2. 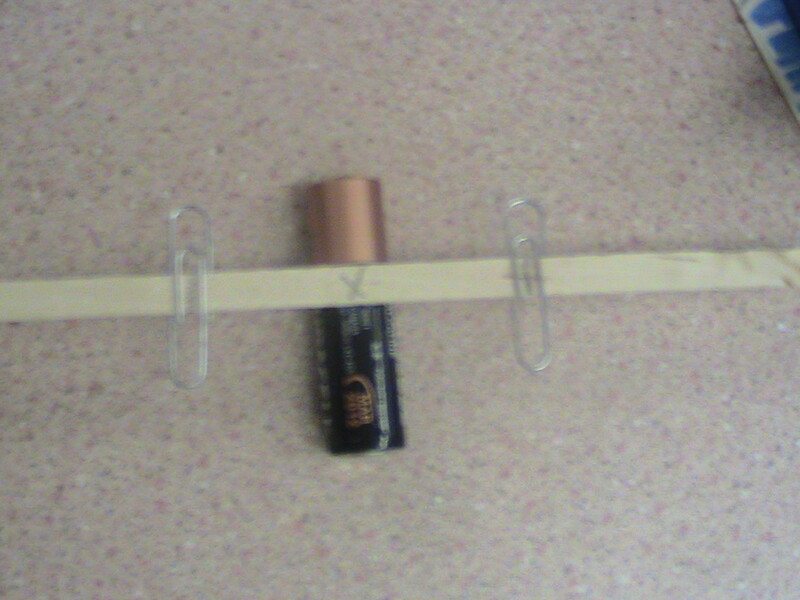 Measure 3 cm from the balance point (fulcrum) and put a mark and place a paper clip there. (the picture below does not have the balance mare but has not been marked for 3 cm. 3. 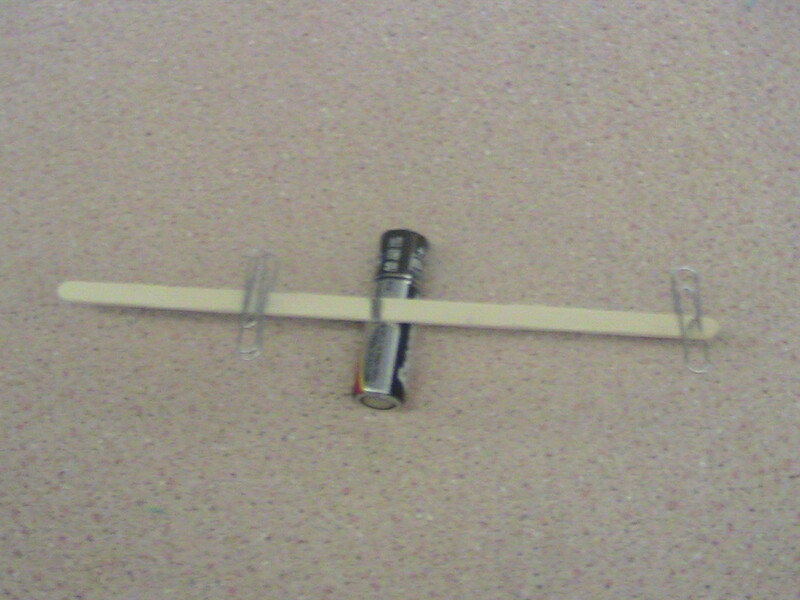 Put another paper clip on the other side of the balance point, and move it in or our until it balances. Mark the spot where the 2nd paper clip is. What distance do you think it will be? 4. Measure the distance from each paper clip to the balance point. Share your answers with your class. 5. Put 2 paper clips on the 3 cm mark you made before, and move the other paper clip until it balances. Mark it and measure it. 6. Collect your data from the whole class- what do you find? Can you see a simple way of predicting the distance of the second (single) paper clip? How does it compare with the distance of the first paper clip?